KE00092 is a solid phase sandwich Enzyme Linked-Immuno-Sorbent Assay (Sandwich ELISA). 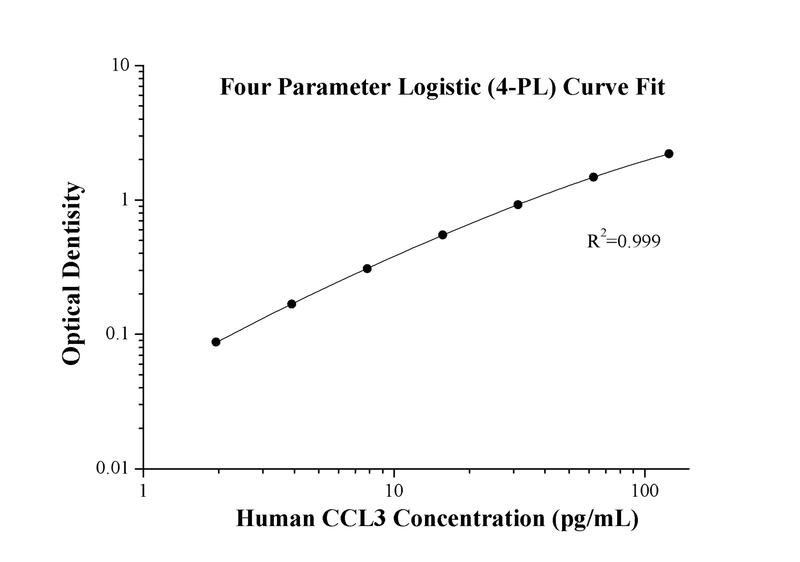 The human CCL3 ELISA kit is to be used to detect and quantify protein levels of endogenous human CCL3. The assay recognizes human CCL3. A monoclonal antibody specific for human CCL3 has been pre-coated onto the microwells. The human CCL3 protein in samples is captured by the coated antibody after incubation. Following extensive washing, a monoclonal antibody of biotinylated specific for human CCL3 is added to detect the captured human CCL3 protein. For signal development, Streptavidin-HRP is added, followed by Tetramethyl-benzidine (TMB) reagent. Solution containing sulfuric acid is used to stop color development and the color intensity which is proportional to the quantity of bound protein is measurable at 450nm with the correction wavelength set at 630 nm. Chemokine (C-C motif) ligand 3 (CCL3), also known as MIP-1α, belongs to the family of chemokines. CCL3 has been found in the central nervous system and its cognate receptors, CCR1 and CCR5, have been reported to be expressed by astrocytes, microglia and neurons. CCL3 and its receptors, CCR1 and CCR5, also contribute to the development of bone disease in multiple myeloma by supporting tumor growth and regulating osteoclast differentiation. CCL3 is also associated with the regulation of cell growth, angiogenesis, and metastasis of different tumors such as melanoma, renal cell carcinoma, and colorectal cancer. Moreover, CCL3 enhances cell migration and metastasis by up-regulating matrix metalloproteinase-2 (MMP)-2 expression in chondrosarcoma cells.